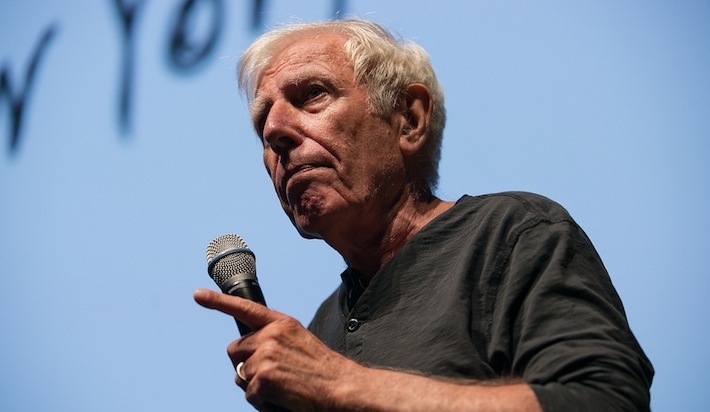 “The most exciting thing you can do as a graphic designer is to reinvent the world every day," declared Pentagram founder and irrepressible philosopher-king Bob Gill. 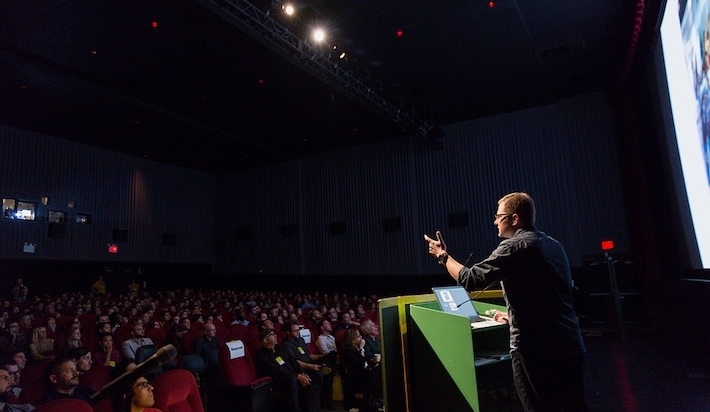 Gill joined more than 500 attendees and fellow design luminaries including Michael Bierut, Debbie Millman, and Armin Vit for the Brand New Conference in New York City last Friday. As Bierut noted, it was a gathering of experts. 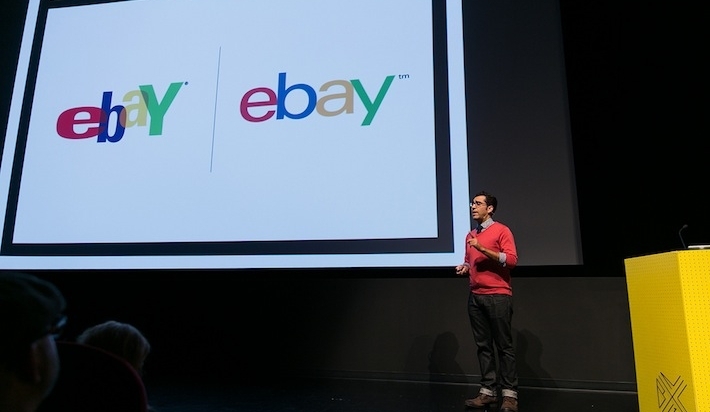 Helvetica-hating, industry-insider, logo-design snarkasm was a reliable refrain. North Carolina-based designer/illustrator Matt Stevens. Photo by Andrew Shepherd © Under Consideration. 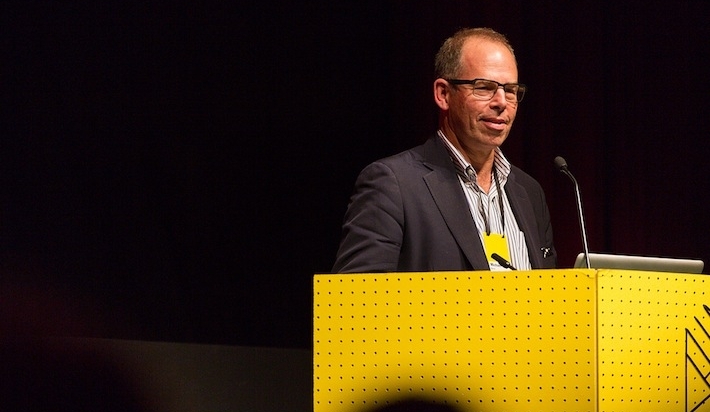 Michael Bierut, a partner in the New York design firm Pentagram. Photo by Andrew Shepherd © Under Consideration. Pentagram founder Bob Gill. Photo by Andrew Shepherd © Under Consideration. Brand New Conference co-organizer Armin Vit. Photo by Andrew Shepherd © Under Consideration. Audience comment card. Andrew Shepherd © Under Consideration. From the Yahoo! logo redesign, to the strategic serifs on the Obama campaign mark, to rejected proposals for the Whitney Museum identity, branding war stories were at the forefront during this all-day event. But the most resonant presentations were those that lacked the built-in gravitas of a big-name client or the inherent self-consciousness of a practitioner working on his own personal brand, or tethered to a famous firm. Best friends since kindergarten, Jason Klein and Casey White formed Brandiose, a San Diego-based practice specializing in minor league baseball logos for America’s heartland cities. 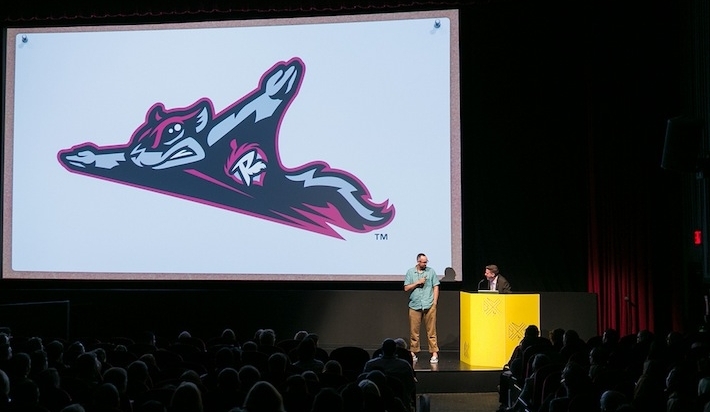 From the Richmond Flying Squirrels to the Bowling Green Hot Rods, to the asparagus-toting Stockton Steve logo, Klein and White have built a thriving business immersing themselves in the history and lore of every city to ever hire them. Their work hinges on creating a memorable emblem that the town can rally around. “It’s fun to think Major league, but we’re minor league baseball guys,” declared White. If the best brands are about authenticity and clarity, Brandiose is grandiose in its candor and straightforward approach. North Carolina-based designer/illustrator Matt Stevens’s work gained wide exposure after his parody of the Dunkin' Donuts logo went viral on April Fools' Day on the Brand New website. Having worked at small- to mid-sized design agencies throughout his career, Stevens decided to open his own practice and leave time to pursue passion projects in between client work. “I’m always trying to chase the feeling of being that kid at the kitchen table drawing stuff.” His self-initiated projects, notably the Max100 project featuring 100 variations on the sneaker archetype, showed off his versatility as an illustrator and led to commissions from paying clients. “Sometimes instinct is just as important as intellect,” Stevens remarked. The Brand New Conference is organized by Armin Vit and Bryony Gomez-Palacio, founders of UnderConsideration. The 2014 conference will be held in Chicago. "Listen to the statement, the statement will often design itself." "What is this? An audience or a jury? This is the last time I come to 23rd Street." "To obtain an original image, you have to remove yourself from the mob." "We design for the circus business." "This is all the magic of Photoshop. That water bottle is going to appear again, don't freak out." "Making is where our seeds of creativity began—making and marking." "Don't ever test anything you can't live with."